The Mediterranean in ca. the 6th century BC. Phoenician cities are labelled in yellow, Greek cities in red, and other cities in grey. Colonies in antiquity were city-states founded from a mother-city (its "metropolis"), not from a territory-at-large. Bonds between a colony and its metropolis remained often close, and took specific forms. However, unlike in the period of European colonialism during the early and late modern era, ancient colonies were usually sovereign and self-governing from their inception. An Egyptian colony that was stationed in southern Canaan dates to slightly before the First Dynasty. Narmer had Egyptian pottery produced in Canaan and exported back to Egypt, from regions such as Arad, En Besor, Rafiah, and Tel ʿErani. Shipbuilding was known to the ancient Egyptians as early as 3000 BC, and perhaps earlier. The Archaeological Institute of America reports that the earliest dated ship—75 feet long, dating to 3000 BC – may have possibly belonged to Pharaoh Aha. Egypt at its height controlled Crete across the Mediterranean Sea. From Gadir the Phoenicians controlled access to the Atlantic Ocean and the trade routes to Britain. The most famous and successful of Phoenician colonies was founded by settlers from Tyre in 814–813 BC and called Kart-Hadasht (Qart-ḥadašt, literally "New Town", known to history as Carthage. 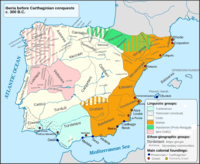 The Carthaginians later founded their own colony in the southeast of Spain, Carthago Nova, which was eventually conquered by their enemy, Rome. In Ancient Greece, colonies were sometimes founded by vanquished people, who left their homes to escape subjection at the hand of a foreign enemy; sometimes as a sequel to civil disorders, when the losers in internecine battles left to form a new city elsewhere; sometimes to get rid of surplus population, and thereby to avoid internal convulsions; and sometimes as a result of ostracism. But in most cases the motivation was to establish and facilitate relations of trade with foreign countries and further the wealth of the mother-city (in Greek metropolis). Colonies were established in Ionia and Thrace as early as the 8th century BC. More than thirty Greek city-states had multiple colonies around the Mediterranean world, with the most active being Miletus, with ninety colonies stretching throughout the Mediterranean Sea, from the shores of the Black Sea and Anatolia (modern Turkey) in the east, to the southern coast of the Iberian Peninsula in the west, as well as several colonies on the Libyan coast of northern Africa, from the late 9th to the 5th centuries BC. There were two similar types of colony, one known as an ἀποικία - apoikia (pl. : ἀποικίαι, apoikiai) and the other as an ἐμπορίov - emporion (pl. : ἐμπορία, emporia). The first type of colony was a city-state on its own; the second was a Greek trading-colony. 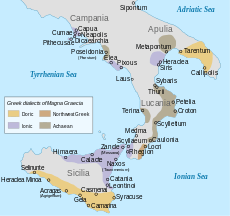 The Greek city-states began establishing colonies around 900 - 800 BC, at first at Al Mina on the coast of Syria and the Greek emporium Pithekoussai at Ischia in the Bay of Naples, both established about 800 BC by Euboeans. Two waves of new colonists set out from Greece at the transition between the "Dark Ages" and the start of the Archaic Period, one in the early 8th century BC and a second burst of the colonizing spirit in the 6th century. Population growth and cramped spaces at home seem an insufficient explanation, while the economical and political dynamics produced by the competitive spirit between the frequently kingless, newly introduced concept of the Greek city-states, striving to expand their sphere of economical influence better fits as their true incentive. Through this Greek expansion the use of coins flourished throughout the Mediterranean Basin. 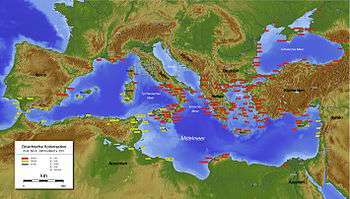 Influential Greek colonies in the western Mediterranean – many of them in today's Italy — included Cyme, Rhegium (Rhegion) by Chalcis and Zankle (c. 8th century), Syracuse by Corinth/Tenea (c. 734 BC), Naxos by Chalcis (c. 734 BC), Massalia (the later Marseille, France, c. 598 BC) and Agathe (shortly after Massalia) by Phokaia, Elea (Italy) and Emporion (nowadays Spain) by Phokaia/Massalia (c. 540 BC and early 6th century), Antipolis (nowadays France) by Achaea, Alalia (Corsica) by Phokaia/Massalia (c. 545 BC) and Cyrene (Cyrenaica, nowadays Libya) by Thera (762/61 and 632/31 BC). 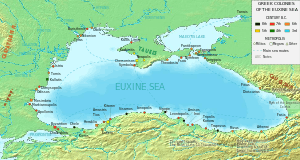 The Greeks also colonised modern-day Crimea on the Black Sea. Among the settlements they established there was the city of Chersonesos, at the site of modern-day Sevastopol. The extensive Greek colonization is remarked upon by Cicero when noting that "It were as though a Greek fringe has been woven about the shores of the barbarians." Several formulae were generally adhered to on the solemn and sacred occasions when a new colony set forth. If a Greek city was sending out a colony, an oracle, especially one such as the Oracle of Delphi, was almost invariably consulted beforehand. Sometimes certain classes of citizens were called upon to take part in the enterprises; sometimes one son was chosen by lot from every house where there were several sons; and strangers expressing a desire to join were admitted. A person of distinction was selected to guide the emigrants and make the necessary arrangements. It was usual to honor these founders of colonies, after their death, as heroes. Some of the sacred fire was taken from the public hearth in the Prytaneum, from which the fire on the public hearth of the new city was kindled. And, just as each individual had his private shrines, so the new community maintained the worship of its chief domestic deities, the colony sending embassies and votive gifts to the mother-city's principal festivals for centuries afterwards. The relation between colony and mother-city, known literally as the metropolis, was viewed as one of mutual affection. Any differences that arose were resolved by peaceful means whenever possible, war being deemed excusable only in cases of extreme necessity. It is worth noting that the Peloponnesian War was in part a result of a dispute between Corinth and her colony of Corcyra (Corfu). The charter of foundation contained general provisions for the arrangement of the affairs of the colony, and also some special enactments. The constitution of the mother-city was usually adopted by the colony, but the new city remained politically independent. The "holy fire" of the metropolis was preserved in a special place to remind the common ties. If the colony sent out a fresh colony on its own account, the mother-city was generally consulted, or was at least requested to furnish a leader. Frequently the colonies declaring their commitment to the various metropolitic alliances formed in the Greek mainland and for religious reasons would pay tribute in religious centres, like Delphi, Olympia or Delos. The cleruchs (κληροῦχοι, klêrouchoi) formed a special class of Greek colonists, each being assigned an individual plot of land (κλῆρος, klêros) in the place to which they had been assigned. The trade factories set up in foreign countries, such as Egypt, were somewhat different from the ordinary colonies, the members retaining the right of domicile in their own fatherland and confining themselves to their own quarter in the foreign city. 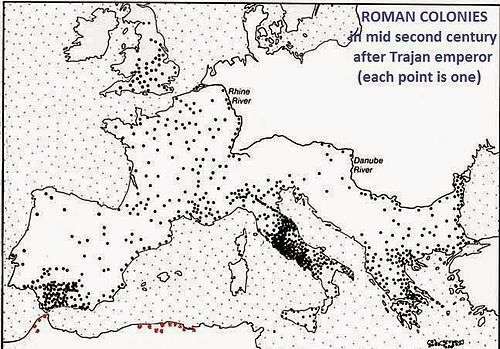 Map showing roman colonies. Augustus' "roman coloniae" in north Africa are depicted in red. From the time of the Gracchi the colonies lost their military character. Colonization came to be regarded as a means of providing for the poorest class of the Roman Plebs. 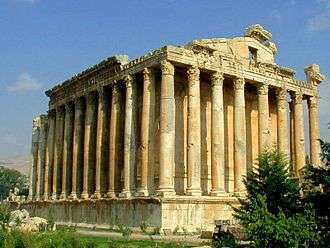 After the time of Sulla it was adopted as a way of granting land to veteran soldiers. The right of founding colonies was taken away from the people by Julius Caesar, and passed into the hands of the Roman emperors, who used it mainly in the provinces for the exclusive purpose of establishing military settlements, partly with the old idea of securing conquered territory. It was only in exceptional cases that the provincial colonies enjoyed the immunity from taxation which was granted to those in Italy. ↑ Naomi Porat (1992). "An Egyptian Colony in Southern Palestine During the Late Predynastic to Early Dynastic". In Edwin C. M. van den Brink. The Nile Delta in Transition: 4th.-3rd. Millennium B.C. : Proceedings of the Seminar Held in Cairo, 21.-24. October 1990, at the Netherlands Institute of Archaeology and Arabic Studies. Van den Brink. pp. 433–440. ISBN 978-965-221-015-9. Retrieved 24 February 2013. 1 2 Naomi Porat, "Local Industry of Egyptian Pottery in Southern Palestine During the Early Bronze I Period," in Bulletin of the Egyptological, Seminar 8 (1986/1987), pp. 109-129. See also University College London web post, 2000. 1 2 Schuster, Angela M.H. "This Old Boat", Dec. 11, 2000. Archaeological Institute of America. ↑ Martín Lillo Carpio (1992). Historia de Cartagena: De Qart-Ḥadašt a Carthago Nova / colaboradores: Martín Lillo Carpio ... Ed. Mediterráneo. Retrieved 12 February 2013. ↑ Sabatino Moscati (January 2001). The Phoenicians. I.B.Tauris. p. 48. ISBN 978-1-85043-533-4. Retrieved 8 August 2013. ↑ Maria Eugenia Aubet (2008). "Political and Economic Implications of the New Phoenician Chronologies" (PDF). Universidad Pompeu Fabra. p. 179. Retrieved 24 February 2013. ↑ Hornblower, Simon; Spawforth, Antony (2003). The Oxford Classical Dictionary. Oxford University Press. p. 1515. ISBN 978-0-19-956738-6. Retrieved 24 February 2013. From the 8th century BC the coast of Thrace was colonised by Greeks. ↑ Nicholas Geoffrey Lemprière Hammond (1959). A history of Greece to 322 B.C. Clarendon Press. p. 109. Retrieved 8 August 2013. ↑ "About Chersonesos, Sevastopol". National Preserve of Tauric Chersonesos. Retrieved 7 April 2014. ↑ "Ancient Greek colonies | 5.97 | Maria Daniels". Perseus.tufts.edu. Retrieved 2009-05-05.